So you may have noticed by now that I love pesto. And I did do two back-to-back posts involving some kind of pasta and this will be my third. But did you know I adore eggplant? Love it in almost all its forms, preparations, and oddities? I heard recently we refer to them as eggplants because once upon a time it was common to see the small white variety that really do resemble eggs, like in the photo above, unlike the large, bulbous, and purple type most of us grew up seeing, at least here in the U.S.
My earliest associations with this nightshade are of goopy, yet delicious, fried eggplant Parmesan dishes served up all over the Long Island of my youth. The southern Italians that fanned out across the island appeared to like eggplant as much as I now do. You couldn’t even really taste the eggplant, it was mostly mozzarella and tomato sauce masquerading as a meal. 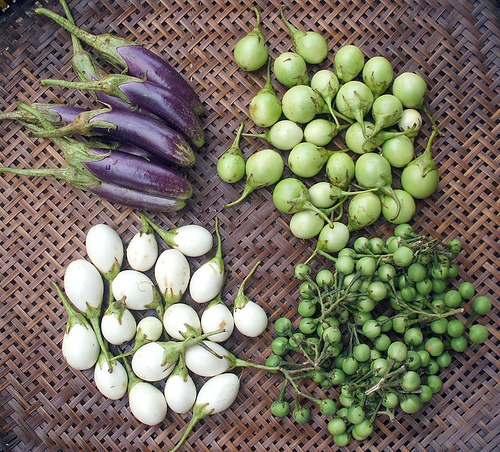 I had no idea back then that eggplants are used in Indian, Middle Eastern, Thai, and Japanese cooking as well. Apparently the Italians don’t have a monopoly on the purple bulb. Its origins are actually Indian. Eggplants are all the rage right now at farmers’ markets in New York City. Big ones, little ones, striped ones, skinny ones, fat ones. They must be drooping heavily from their plants at farms upstate in the heat and sunshine of the past month. Eggplants like it hot. I saw them on Saturday at McCarren Park but passed them over in favor of other in-season veggies, so when I eyed them at today’s market in Union Square on my way to work (I swear I have another legitimate reason to hang around Union Square besides stalking vegetables), I decided to buy one in the hopes I’d make something of it for dinner tonight. But first, a digression. I sometimes hear that shopping at farmers’ markets is expensive. A luxury that only those with disposable incomes can afford. Granted, some items at the market are expensive and can be had for less at grocery stores. I would love to buy local NYC honey for example, but often can’t afford it. Or perhaps I can afford it, but we’re making decisions all the time about what to spend our hard-earned money on and what not to. And I think that’s the point isn’t it? I go on and on about farmers’ markets and seasonal vegetables and I put my money where my mouth is. To me, good quality food is important. So is a good value. There are lots of things I pass up at the market because I’m not willing to spend over a certain amount on certain things. But there are lots of things at the market I am willing to pay for, often because the quality and taste is exceptional and it’s a good value. And, because I love food and eating in season and eating a tomato that tastes like a tomato. I don’t really spend money on concerts, sporting events, yoga, alcohol, pets, phones or other tech gadgets, teeth whitening, or a number of other things you may part with your money for. For me, it’s food, travel, books, and the occasional movie ticket. We’re always choosing what to do with our money, if we’re lucky to have a little extra after we pay the bills. Let’s cut to the chase. The eggplant around which I built tonight’s dinner cost $1.25 (less than almost every cup of coffee in NYC these days). 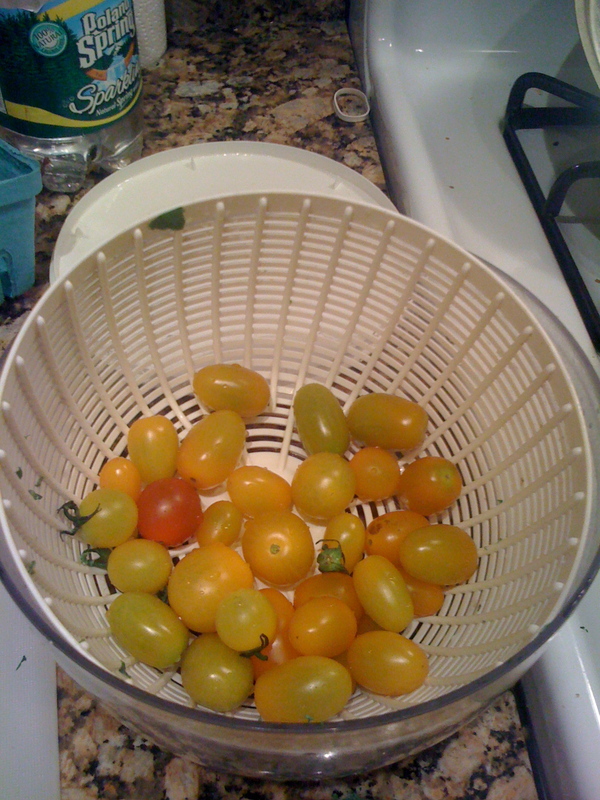 The pint of splendid sungold cherry tomatoes was $3.50 (definitely less than a latte at Starbucks). The kale I bought at the youth farmers’ market in Clinton Hill yesterday was a whopping $2 (probably less than a Whopper). The pasta I bought in bulk from the food co-op (some Whole Foods also sell pasta in bulk) and the amount I used tonight cost approximately 75¢. Let’s talk peaches: 3 for $2 at today’s market. Maybe that sounds like a lot, maybe it doesn’t. All I know is, when I bit into it this afternoon, its juices dripped down my arm and the yellow flesh tasted of the best memories of summer. Worth every 67 pennies. So tonight’s meal cost somewhere around $7.50 and made 4 servings. That’s $1.88 per serving. Or what I call a happy meal. Now economics aside, it’s time to get cooking. By the time I got home and rolling it was nearing 9 pm, not an unusual start time for dinner prep in my apartment. I put a pot of salted water on the stove to boil for the pasta. I then got out a large sauté pan, added to it 1-2 tbsp olive oil, and turned up the heat. While the pan got hot I chopped one shallot and 3 leftover scapes I still had in my fridge. 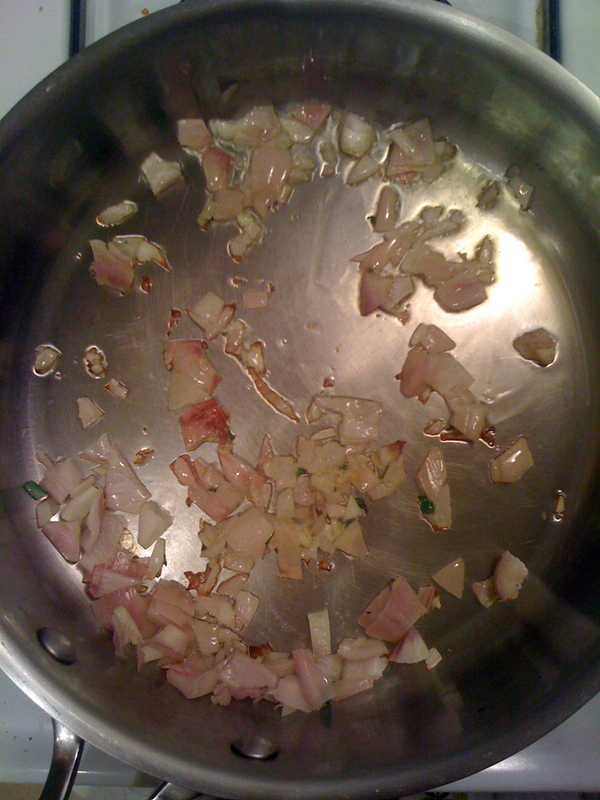 Threw them into the sauté pan and let that go for about 4-5 minutes until the onions browned. Meanwhile I diced and salted the eggplant then threw that into the pan. I washed and chopped a bunch of kale (it was probably 5-6 cups) and added that to the pan after the eggplant looked mostly cooked. Once the water in my pasta pot boiled I added about 1 cup of tri-color rotini, let it cook for 7-8 minutes, al dente. 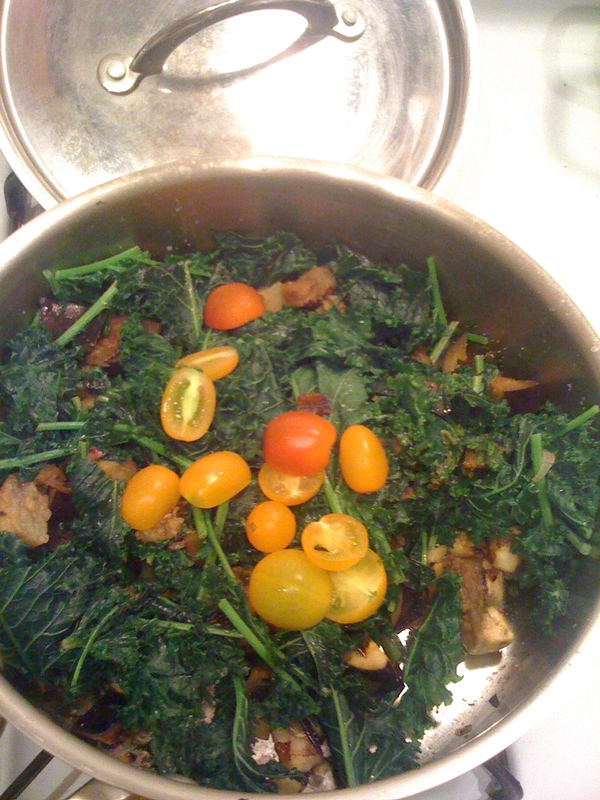 Once the kale had wilted I added 1 cup of the cherry tomatoes, sliced in half, and turned the heat off. I didn’t need for the tomatoes to cook, just to get a little squishy and warm, which they did beautifully. I then drained the pasta and added it to the pan of veggies. The pièce de résistance was 4 tbsp of leftover homemade basil pesto stirred in at the end for a little kick.